After a week of popular revolt two million people are demonstrating in Cairo today demanding that president Mubarak and his son leave the country and that the regime be changed. An indefinite general strike has also been called by organisers of the movement. The revolt which started last Tuesday with small groups in their hundreds marching and meeting up has now engulfed all of Egyptian society, resulting in the collapse of the police force and the deployment of the army. Ordinary Egyptians formed Neighboorhood Defence Committees to patrol their streets and a new Federation of Unions has been declared. In the streets today the mass of people are debating what the next steps are as opposition groups struggle to be seen as the leadership of this essentially leaderless movement. A Dublin inquest last week heard how a young Ballymun mother died of hypothermia after Dublin City Council turned off her heating during what was described as “perilously cold” weather in January of last year. Following the refusal of Mubarak to resign a mob of his supporters attempted to fight their way into Tahir square in Cairo where anti-Mubarak protests demanding democracy have rallied over the last week. Some of the mob who have been captured were carrying police ID's. The intention appears to be to either drive the democracy protesters off the streets and/or create an excuse for army intervention to 'restore stability,' something the official opposition is now calling for. The UN has issued a statement fearing that 300 have been killed and 500 injured, its unclear if this refers just to today's events. Live broadcasts from Al Jazeera indicate that there have been serious injuries including a journalist who has been stabbed. Footage showed the attack opening with men mounted on camels and horses charging into the square and into the line of anti-government protesters that had linked arms with some people being trampled and some attackers pulled off their horses. In an initiative launched by the Minister for Social Protection Éamon Ó Cuív, about three million 'Public Services Cards' will begin to issue in the coming months to 'people over 16 years of age who can access public services'. The 'Public Services Card' will include security features such as laser engraving personalisation similar to that used in the latest Irish passports, a contact chip, a signature, photograph and an expiry date. Friday was declared 'Departure Friday' by democracy protesters in Egypt as a second Friday of mass protest was been called to drive president Mubarak from his 30 year reign. Huge numberstook part in these protests. Recent days have seen intense street fighting as protesters had to defend themselves from mobs mobilised in a desperate bid by Mubarak to hold onto power. Meanwhile there are dozens of disturbing reports of secret police arresting protesters at their homes and workplaces. There has also been a sustained violent campaign against journalists which has forced the majority of them off the streets and onto balconies around the square. On Friday morning Aj Jazeera had its Cairo offices trashed. This is a collection of articles on Education struggles in Ireland and elsewhere over the last decade. Most have been written by anarchists and are first hand accounts of struggles the authors were involved in. We are making them available so new generations of activists could learn what worked and did not work in these earlier struggles. Up to 150 students, nurses, college lecturers and activists including WSM braved the wet and dreary conditions to voice their dissatisfaction at the government's proposed pay-cut to student nurse-interns. 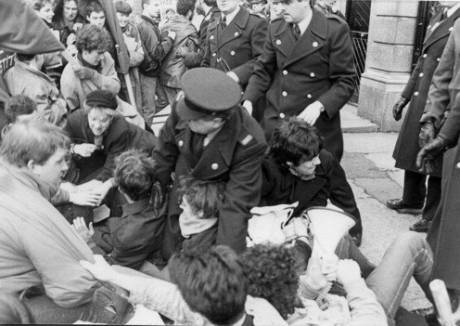 The protest held at the gate of Mayo General Hospital was organised by the Irish Nurses and Midwives organisation -Ireland's main Nursing union. Whilst good humoured, there was a palpable anger underlying today's protest which was one of many taking part nationwide. The message is clear from the student nurses and their qualified counterparts - NO PAY, NO WAY - NO TO SLAVE LABOUR. As the struggle for democracy in Egypt continues to rapidly develop WSM members are using twitter to monitor news from protesters and good media source on the ground there and sharing important updates via our twitter account. You too can see what we are selecting from the huge amount of information pouring onto twitter by following the WSM twitter feed. The latest tweets are below. At 2.00pm on Saturday 12th February, the WSM will be joining members of Dublin Shell to Sea and supporters who are gathering at the top of Grafton Street (St. Stephen's Green) to distribute €540 billion ‘commemorative bank notes’ to members of the public, symbolising the cost to the exchequer of the extraordinary giveaway of Ireland’s oil and gas reserves. An Irish general election fever grips this place, where promises flow like water running off a mountain, and where the sun, the moon, and the stars are laid at the feet of the people, all for the sake of a no. 1 on the day itself. From looking around us now you witness the desperate scramble of prospective candidates to get into power, into the Dáil, to receive their €100,000 PA salary plus expenses. Jobs and Reform appear to be on top of the agenda, yet no one appears to be responsible for the transgressions of the past. 800 delegates representing Irish National Teachers Organisation members from across the country have voted overwhelmingly to reject a government scheme which would have seen unemployed teachers working for free in our schools. On Saturday members and supporters of Dublin Shell to Sea gathered the top of Grafton Street to distribute €540 billion ‘commemorative bank notes’ to members of the public, symbolising the cost to the exchequer of the extraordinary giveaway of Ireland’s oil and gas reserves. This was part of a national Shell to Sea day that saw leafletting in 8 other towns and cities around Ireland as well as Dublin. The Independent Workers Union (Cork Branch) has launched a series of posters that have been displayed on poles around Cork city. The posters raise five demands from the unions manifesto of resistance. Despite the empty promises of Minister for Finance, Brian Lenihan employers have started to try and impose the 1 euro cut in the minimum wage on workers in Dublin. SIPTU placed pickets on the Davenport Hotel in Dublin after workers were taken off the roster for refusing to sign new contracts reducing their wage rate by almost €1 an hour. The workers concerned who are all women from Eastern Europe were brought into three meetings by management over the last three weeks and repeatedly told they must sign the new contracts or face being taken off the roster. According to SITPU they were not given a copy of the new contract, either in English or in their own languages. A decade after the process was begun to impose an experimental raw gas pipeline and refinery on the people of Erris we are entering into the final stage of the battle opposing its construction. Shell are about to attempt to lay the onshore pipe. Shell always expected this to be the most difficult part of the struggle which is why they left the attempt to build this section of pipeline till last. Libyan leader Gaddafi is in the final throes of his dicatatorship as mass demonstrations take place across the country,as tribal leaders , political allies and army units switch sides. The courageous actions of the mass of protestors despite brutal murderous attacks by security forces still loyal to the regime, have confounded the dicatorship. Much as in Egypt people have not broken under the attacks but become more enraged. Bahrains monarchy is teetering. Even China is now feeling the effects of this wave of protest and defiance with protests at a number of centres yesterday. No political party would be allowed to take power on a platform of taking their riches from the wealthy 1%. Their huge wealth gives them political power. The power and wealth cannot be taken from the elite through the ballot box, it can only happen by a massive social upheaval. T he attack on workers at the Davenport Hotel in Dublin had highlighted the greed and bullying in the hotel business. A similar case to that at the Davenport has come to light here in Cork. But so far fear has ruled the day. The Clarion describes itself as one of “Cork’s premier 4 Star City Centre Hotels”. Although it’s well able to charge for its rooms it cannot find its way to granting its workers a 29 cents per hour pay rise. The election will be over, the new government will be formed. But what will have changed? The 1% elite will still own 34% of the wealth.